Arriving at the Cubs Convention, I was pleased with how smooth parking and hotel check-in went at the Hilton Chicago. There are Cubs signs and fans everywhere and the staff is wearing Cubs logo “Hilton Staff” t-shirts. There is definately a nice vibe developing here. 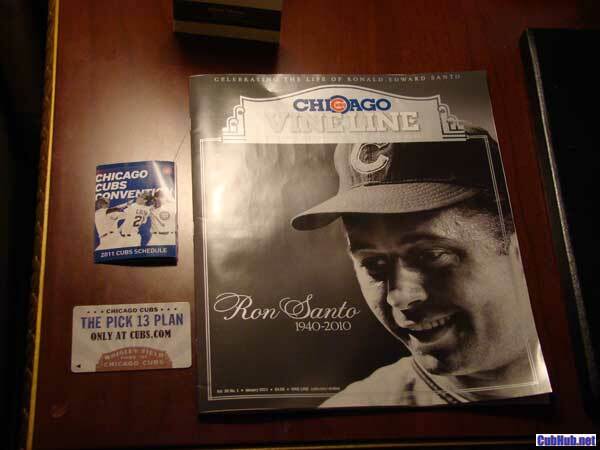 I was greeted in my room with a copy of the Ron Santo commemerative VineLine magazine, a Cubs Convention 2011 pocket schedule, and the room key is advertising the “Pick 13” plan!